I know the perfect place for an amazing biking weekend – but don’t tell anyone! What’s the best biking destination in the UK? Wales perhaps, or maybe the Lake District? Both have lovely roads but these tend to get a little too busy for true motorcycling enjoyment. What about the Highlands in Scotland, with all those dramatic views and twisty roads? The only thing is that for most of us, the Highlands are rather a long way away. So what if I told you that you could find roads that are as quiet (if not more so) as those of northern Scotland, and every bit as good as the passes in the Lakes or the twisties in Wales without having to travel to the edge of the earth? Now, if I tell you where to go, you must promise to keep this to yourself, right? The Multistrad posing in front of the Talla reservoir. From my house in the East Midlands, I can ride to Moffat in Dumfries and Galloway in well under four hours. That means that I can get there after work, and still have a drink or two in the hotel bar before bed. Granted, that four-hour ride up is not the most exciting, but the rewards on arrival are worth it. Moffat, it seems, is a portal into a large chunk of biking heaven. Not breakdown! Just a moment of contemplation. In the past I have always zipped through the south of Scotland in my haste to hit the Highlands in the far north-west of the UK. 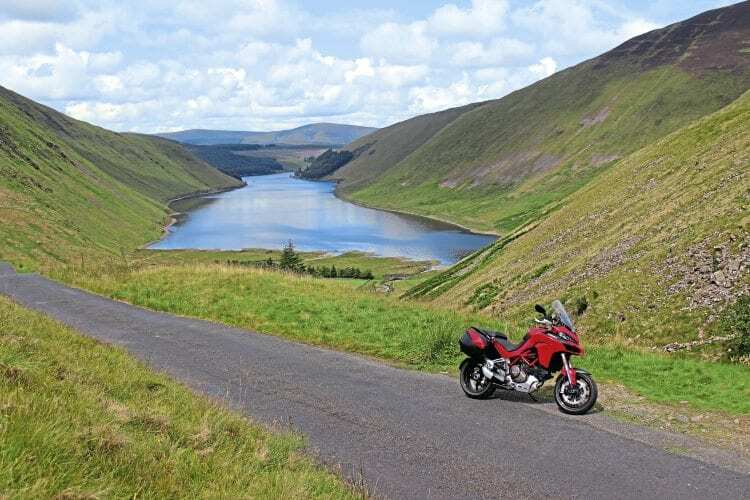 But my recent trip to Dumfries and Galloway, just north of the Scottish border has opened my eyes to a whole new playground for motorcyclists. I based myself in Moffat, just off the A74(M) and within a stone’s throw (maybe a couple of throws…) from the English border. I’d never ridden here other than passing by, but a few people had mentioned how good the roads are, how little traffic there is and how accessible it all is, so I decided to give it a go. The Buccleuch Arms in Moffat. 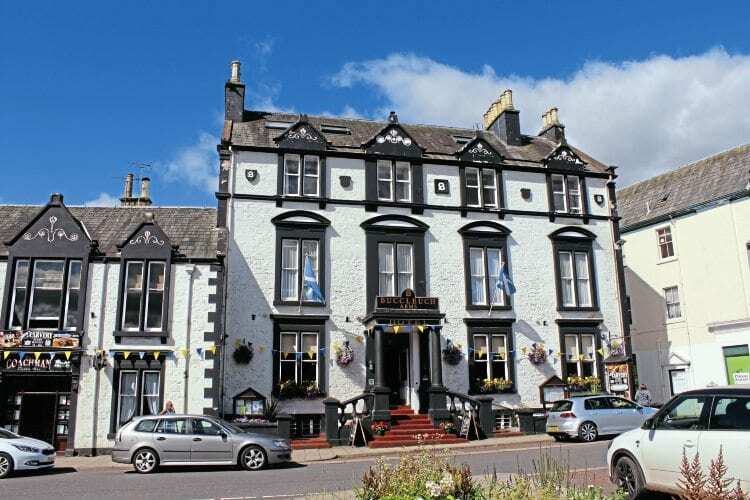 I stayed at the Buccleuch Arms Hotel in Moffat for two reasons. 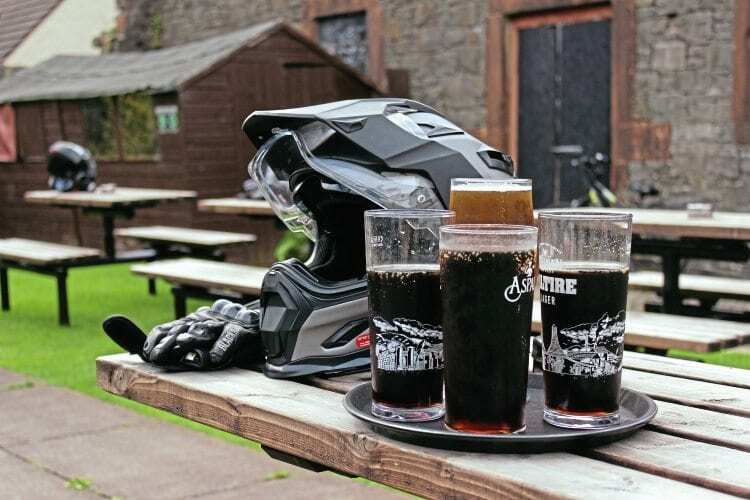 Firstly, it’s a biker-friendly place run by people who ride themselves, with secure bike parking on site, and even complementary bike maintenance products if you start to develop WD-40 withdrawal symptoms while you’re away. My second reason for picking this place was that Dave who runs it knows every road worth riding within a hundred mile radius. So if I was going to get the best out of this place, I needed to talk to Dave. 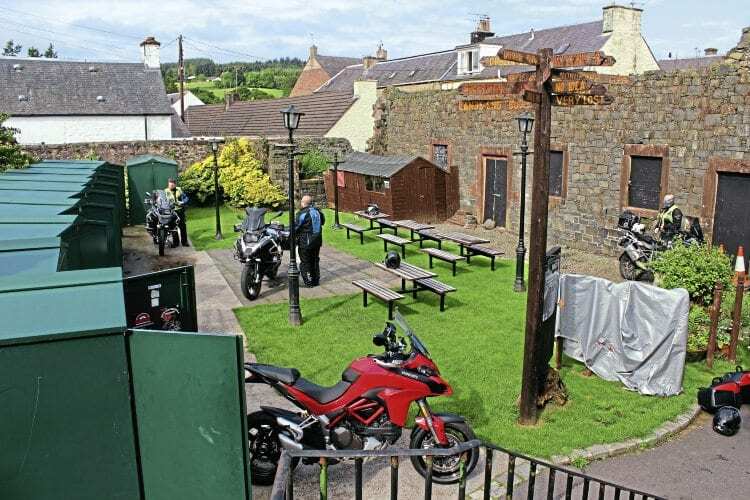 Plenty of bikers stop at the Buccleuch Arms. And sure enough, Dave had the answer. After a quick chat over breakfast about the type of roads I enjoy riding, the bike I was on, and how far I wanted to go, Dave uploaded one of his routes to my TomTom 450 Rider (which took all of two minutes) and I was ready to go. The route that Dave had planned for me consisted of two loops around Moffat and returning back to the hotel just in time for dinner. You can get pretty high even this far south of the Highlands. The early indications were good as I left town and got straight on the B719 and B7076 service road that runs alongside the motorway that I usually take to bypass this region. There was more than a little satisfaction in seeing the cars, lorries and bikes on the boring, wide and straight bit of tarmac, while I was pouncing from corner to corner secure in the knowledge that even better roads were ahead. The next road, the B7040, was a proper rollercoaster, perfect for waking me up after my big breakfast. It climbed up the hill to Leadhills. From there the B797 took me to Wanlockhead, the highest village in Scotland, with a lead mining museum that apparently is worth a visit. But there was no amount of lead that was going to get me off my bike, and I carried on without stopping. 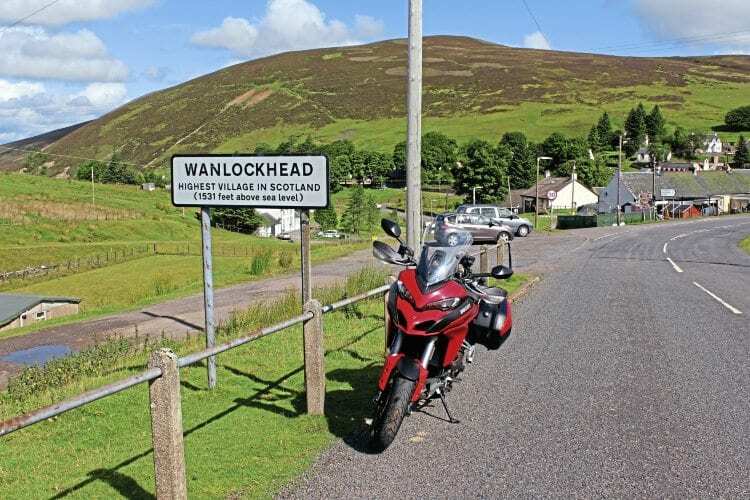 From Wanlockhead the B797 started to snake down into a valley with a river running through it and heather-clad hills rising on either side. The spectacular scenery reminded me of the Lake District, but apart from a couple of walkers and a flock of sheep, there was nobody else around. Had this actually been the Lakes, I probably would have been following a queue of tour buses. Decisions, decisions… Both ways offer great riding. The next section of the route, namely the A76 and the A702, was another sprint through gentle bends in the woods, until the vista opened up and you could see the road for miles ahead. Riding on roads like that is rewarding regardless of how fast or how slow you go – there’s plenty of enjoyment in them for everyone. I decided to make the most of the good visibility and smooth tarmac and set a sporty pace. The A702 completed the first loop of the ride, bringing me back to the 7076 towards Moffat. But before reaching the town, we turned off onto the A701, the Edinburgh Scenic Route as it’s also known, and skirted round the Devil’s Beef Tub, a 500ft (150m) deep hollow just north of Moffat. The A701 would have been another fast stretch with invitingly gentle corners linking up for miles, but the road was being resurfaced and I ended up crawling along for what seemed like an eternity. It turned out this was not a Tardis. Eventually I came to a crossroads in Tweedsmuir where Dave’s route took a turn into a single track that led to the Talla reservoir, followed its shores, and then clung on to a hillside to carry me up to the top of a narrow pass. Again, the scenery had transformed into proper Scottish mountains and lakes, and I started to understand why people had been talking so enthusiastically about this part of the world. I had only met a handful of cars all day, enjoyed some excellent roads and breathtaking scenery, and there was still more to come – all of this just north of the border with England. Over the hill there was another reservoir, Meggat, that the route passed before linking with the legendary A708 that runs from Moffat to Selkirk. By now I was starting to get hungry, so I stopped soon after turning south on the A708 at Glen’s cafe, a little wood-built eatery with views over Loch of the Lowes. A delicious bacon butty and a coffee later, I was back on the road, heading down south towards Moffat again. As much as I had enjoyed the scenic pass and the reservoirs before lunch, it was fun to be on a fast road again, and I upped the pace as I counted the miles down to Moffat. Well-earned drinks after the ride. Not all of them were for me. 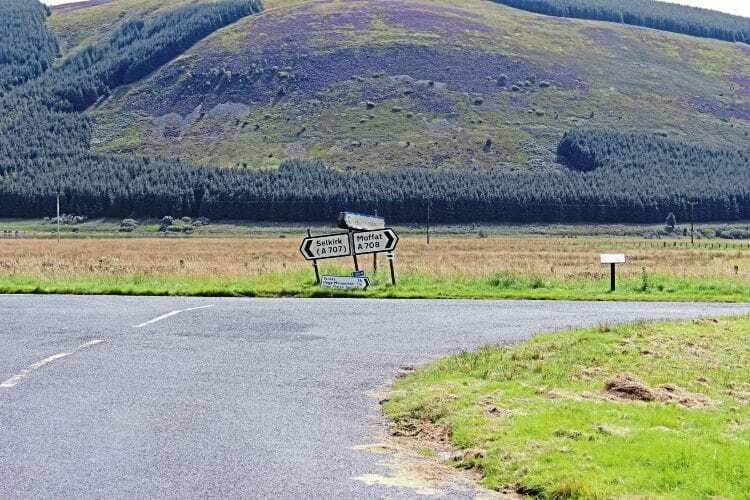 The A708 is a cracker of a road, with slow bends, fast bends, uphills and downhills in such abundance that it feels more like a fairground ride than a road. It was the perfect road to finish the ride with, and I arrived in Moffat and back to the Buccleuch Arms with plenty of day still left. I was tempted to go and revisit some of the roads, but the truth was that I was knackered after all the riding. I might not have done that many miles, but the varied roads, concentration and reasonable pace had all taken their toll, and I decided to head to the bar instead. 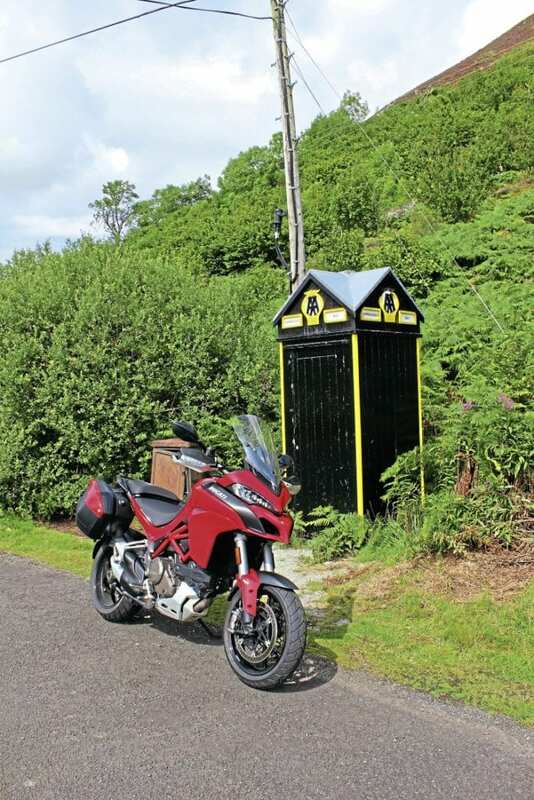 So next time you think about rides in Scotland being a million miles away, spare a thought for the more accessible areas of the country. You might be pleasantly surprised – I certainly was! The Multistrada proved to be a great bike for a trip like this. With the optional panniers and my Kriega R30 backpack I could carry everything I needed. And thanks to the semi-active suspension, all I needed to do to add rear preload to allow for the extra weight was to push a button. 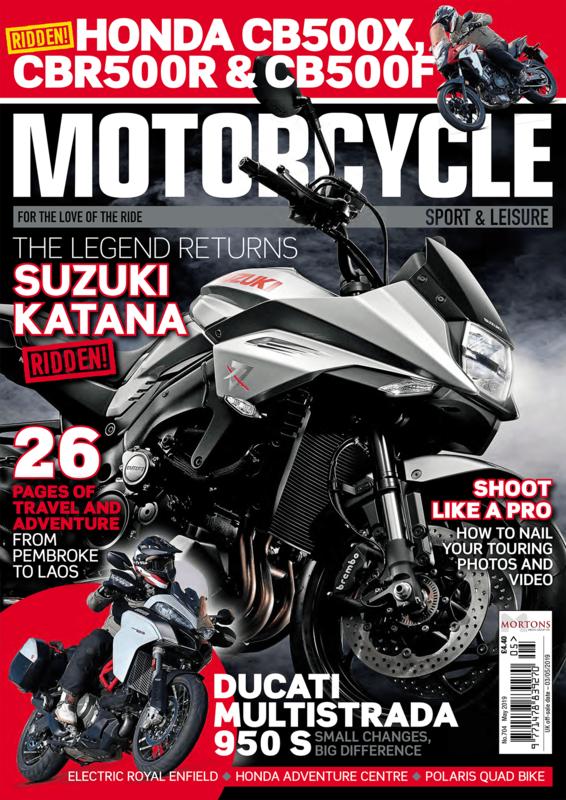 The whole electronics package on the bike is truly astonishing, with the bike turning from a docile tourer into a fire-breathing superbike with just a change of ride mode from Touring to Sport. On the long motorway slog up and down the country the adjustable screen, plush seat and relaxed riding position guaranteed a comfortable ride, even when the roads didn’t excite. 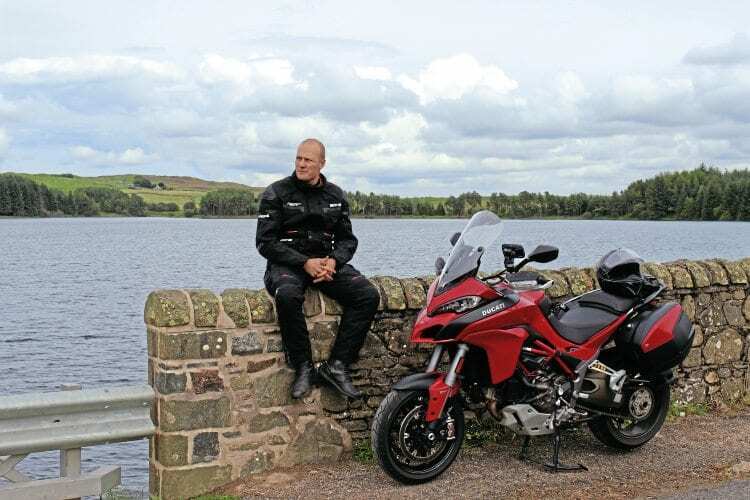 Once up on Scotland, the Multistrada was in its element on the twisty roads, with the wide bars helping to steer it into corners and the Pirelli Scorpion Trail II tyres keeping the bike glued to the Tarmac. The only thing that at time let the side down was the front suspension. It was fine on rough surfaces at slow speeds and on smoother ones at high speeds, but if you hit a rough corner at high speeds it started to feel a little skittish. Nothing that a slightly slower pace wouldn’t fix, but something that you’d expect to be absolutely flawless at this price point. Overall the Multistrada was a great tool for this trip, tackling every road with enthusiasm, offering a thrilling ride and still leaving me feeling fresh at the end of the day. I would more than happily do it all over again. Next Post:March 2019 Issue OUT NOW!